Delivering the news of great eats in plain talk terms. Whether you adore cooking or you're just figuring it out, we'll have fun dishing up the delicious! It's the summer corn that makes this delicious dish, adding a little bite of sweetness to all the other savory ingredients. Loaded with a mix of vegetables - whatever the market yields or whatever you prefer - and finished with grains, beans, and cheese, this is the perfect main dish for summer and requires no cooking. I do not apply the word "cooking" to this couscous since it requires only hot water poured over it to steep. But you can pretend to be cooking if you wish! So, start that couscous first and by the time it's ready and cooled you'll have the vegetables chopped, dressing made, and dinner or luncheon will be ready for the table. Do people eat luncheon anymore? I'm calling it luncheon, recalling past days of cool summer lunch dishes in southern cafes or ladies lunching spots in fancy department stores with dainty little portions that would be the object of guffaws today. Sigh. Back to our couscous. It's fine to buy it in the box, for instance Far East brand, just be sure to leave out the packet of seasonings. 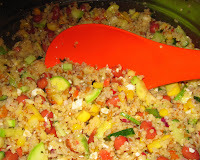 The dressing for this dish is much better than the box seasonings and full of great flavors. If you're using couscous bought in bulk, Pour 1-1/2 cups boiling water over 1 cup dry couscous and let sit for 5-10 minutes without stirring. Fluff with a fork when done. You should have about 2-1/2 cups. 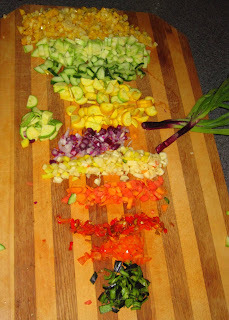 This is the mix of vegetables that I used which is an ideal balance of sweet, hot, crunchy, spicy, and savory. You can use what you like, but try this mix if you can or something very close to it at least once: 2 ears of corn (microwaved for 5 minutes), one zucchini, 1 cucumber,1 yellow squash, 2-3 green onions or 1 small vidalia, 1 large or several small carrots, 1 sweet red pepper, 1 small hot pepper. Cut the corn from the cob and finely dice everything else. Toss the vegetables and couscous together and top with the dressing recipe below. Clickity here for Cutting Corn Off the Cob notes near the bottom of that page, plus a bonus recipe for Summer Corn Soup. 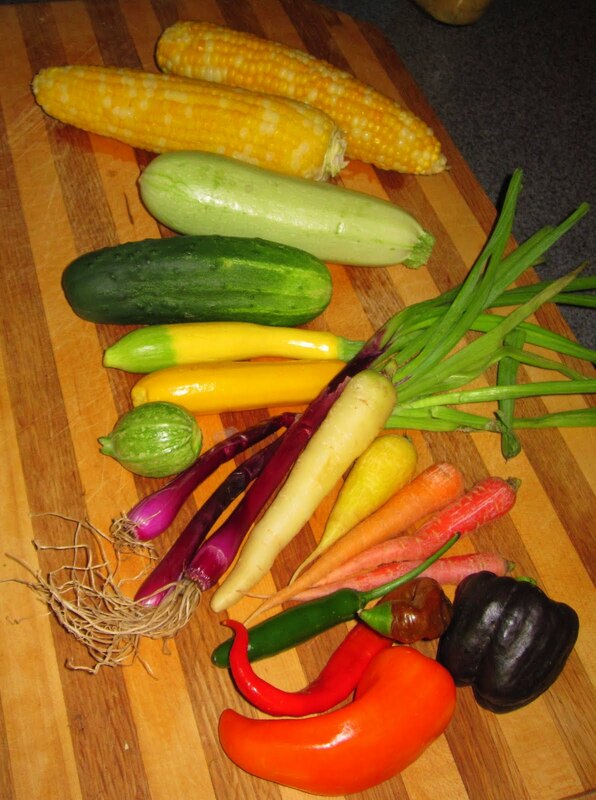 Now, I know that the colorful batch of vegetables in this picture is a little different from the list above. It just happened that I found some crazy looking PURPLE onions and peppers and carrots that were white and pink and ROUND zucchini and WHITE zucchini and those oddities were irresistible to me. Oh, how I love the Farmer's Markets at the height of the local season when such funny things are available.Also, I just used a small part of each of those peppers in the picture which equaled about one hot and one sweet in the end. 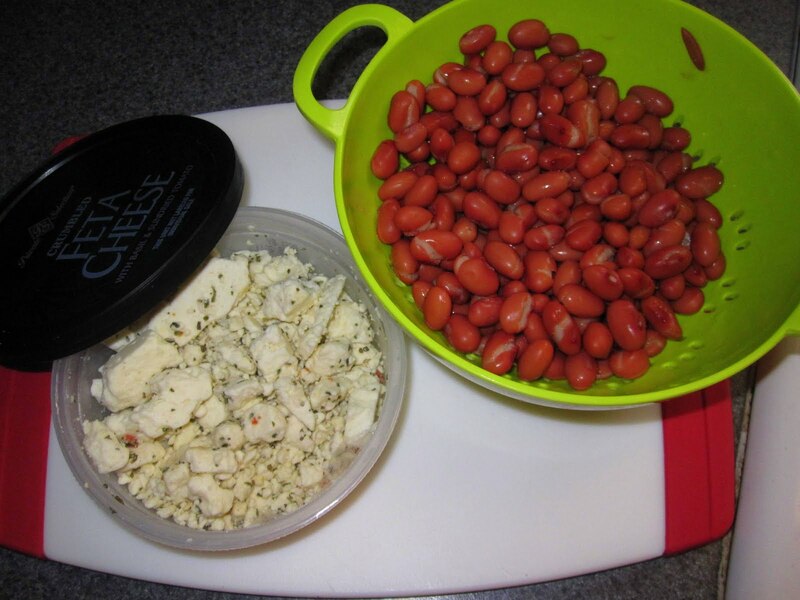 To round out this salad's flavor add 1 can of beans, such as red or black or garbanzo, and a cup of feta cheese. This addition will make the dish a complete protein by combining grains and beans, not to mention the additional texture element this brings. And finally we're going to finish it off with the dressing that really pulls it all together. One word of warning on this dressing. It's delish, but too much of a good thing is not a better thing. 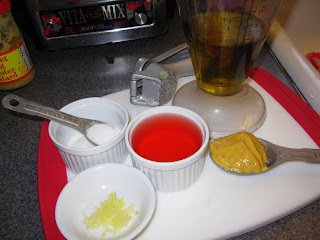 Add about half the dressing, mix really well, and taste before you add more. 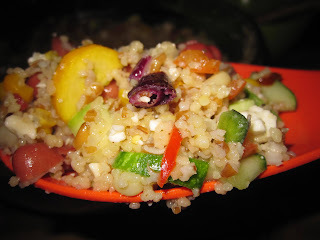 If you're refrigerating this before serving, toss really well and check the dressing again before you serve because the couscous will really soak it up, possibly requiring more, but you still don't want it too wet with an overload of dressing. Whisk or shake it all together, taste for additional sugar if it's too tangy. As in, if you pucker up when tasting it, you probably need an extra tsp or two of sugar. Colorful and Oh-So-Tasty. Looks like confetti salad, doesn't it? What a beautiful salad! I love all the colors and the dressing sounds wonderful! This looks so tasty! A salad like this is right up my alley! love this hearty salad!! I could eat this for days and love it more each time! This would be one of those light dish perfect for summer ! How do you lose 60 pounds when you love to eat and manage to keep it off? You'll find my story if you click "About Me" on that Tab Bar at the top.